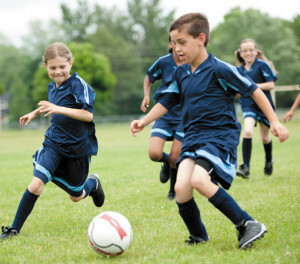 Preliminary findings from Stanford Uni­versity add to the growing body of evi­dence suggesting that playing soccer or basketball at an early age helps lower the risk of stress fracture in athletes who go on to become dedicated runners. In 800 high school runners, investigators found that those who experienced stress fractures averaged 4.5 years playing ball sports, compared to 7.7 years in those without stress fracture. The average age at initial participation in ball sports was 8.6 years in those with stress fracture and seven years in those without. Michael Fredericson, MD, professor and director of the PM&R Sports Medicine Service at Stanford University Medical Center in Stanford, CA, presented the early study results in November at the annual meeting of the American Academy of Physical Medicine & Rehabilitation (AAPM&R). Fredericson delivered a keynote address on sports participation and bone health in conjunction with his receiving the PASSOR (Physiatric Association of Spine, Sports, and Occupational Rehabilitation) Legacy Award. The new findings in high school runners are consistent with those of a May 2005 study in which Fredericson and colleagues assessed history of stress fracture and ball sports participation in 274 adult runners. In that study, published in the Clinical Journal of Sports Medicine, those with previous ball sport experience had a 50% lower risk of stress fractures than those who did not play ball sports. Relative risk decreased by 13% per year of ball sports played. In female runners, however, low bone mineral density (BMD) can also be complicated by the two other components of the female athlete triad—menstrual irregularities and low energy availability. In the 2005 study, female runners with menstrual irregularities received no benefit from previous ball sport participation. And runners with poor nutrition are likely not consuming enough calcium—something that studies show can dramatically improve bone health and decrease fracture risk. A 2010 collaborative study including researchers from the Stanford group found that in 125 collegiate distance runners, higher intakes of dietary calcium were associated with lower rates of stress fracture. In particular, each cup of skim milk consumed per day was associated with a 62% reduction in stress fracture incidence. Those results were published in the August 2010 issue of PM&R. Another Stanford study presented at the AAPM&R meeting suggests that calcium occurring naturally in foods is more effective for improving bone health than calcium-fortified foods or calcium supplements. Researchers assessed bone mineral density and nutritional habits in 94 female high school distance runners, and found that consumption of milk and other dairy products was significantly correlated with total body BMD, but that consumption of calcium fortified foods or supplemental calcium were not. Sources: Fredericson M, Ngo J, Cobb K. Effects of ball sports on future risk of stress fracture in runners. Clin J Sport Med 2005;15(3):136-141. Nieves JW, Melsop K, Curtis M, et al. Nutritional factors that influence change in bone density and stress fracture risk among young female cross-country runners. PMR 2010;2(8): 740-750. Sayres L, Arroyo J, Collado H, et al. Dietary intake as a predictor of low bone density in young female runners. PMR;3(10):Abstract 802: S164.